DALTON, Ga. -- It took a while for the Dalton High School soccer team to match Greenbrier's intensity Tuesday evening in their Georgia Class AAAAA state semifinal. But once the Catamounts did, they overmatched the Wolverines. Kobe Perez and Isai Hernandez scored two goals apiece and the nation's top-ranked team according to Maxpreps advanced to its third consecutive state final with a 6-0 win at Harmon Field. The Catamounts (19-0) will face Allatoona at 7:30 p.m. Friday at Five Star Stadium in Macon. The Buccaneers defeated Riverwood in penalty kicks in the other semifinal. The Wolverines (19-2-1) had a pair of dangerous opportunities in the first 10 minutes of action Tuesday, with one shot on a corner kick nicking the side post and a second on a header hitting the crossbar. 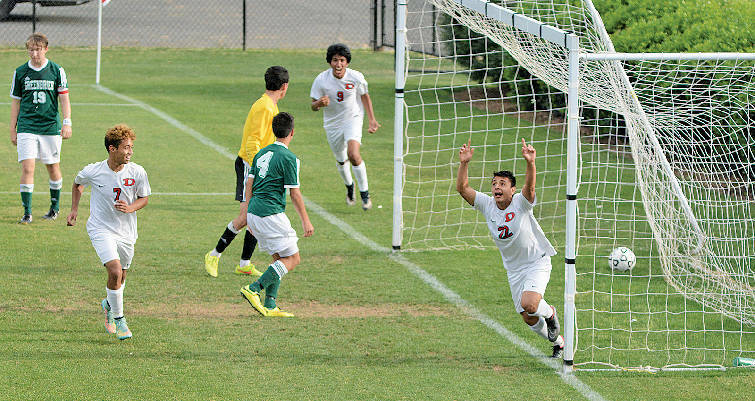 Dalton's Gibby Perez, right, celebrates after scoring a goal to put his team up 3-0 as Dalton hosts Greenbrier in a Class AAAAA state semifinal soccer match Tuesday at Harmon Field. The nationally top-ranked Catamounts won 6-0. "We like to start quick, but we haven't been able to do that the past few matches," Perez said. "When we realized they were coming at us hard with everything they've got, we had to focus and flip the switch on them." Perez himself started the "flipping of the switch" in the 28th minute, using some fancy footwork around the box to slot a shot past goalkeeper Conner Washer. Hernandez followed with a shot from about 20 yards out, then found a cutting Gibby Perez for a goal with about three minutes to play in the half for a 3-0 advantage. The game was chippy throughout and got ugly at times. Players were continually having to be separated, and seven yellow cards were issued during the match -- six to Greenbrier, which lost coach Tony Cummings and senior Logan Tihey to ejections. Tihey's was a "soft" red card as a result of two yellows. "I told our guys to go in hard for 50-50 balls and to expect to get hit," Dalton coach Matt Cheaves said. "I told them not to react and to try and play through it. We don't want to play that style, but we can play it. "We were more emotional than I would like us to be, but we had to match them and realize what was going to be called. We had to play to it or we were going to get taken advantage of and beaten." Wolverines forward Mekhi Honore, who stands 6-foot-5, was man-marked by Dalton's Hernan Saldana throughout the match, at times frustrating the junior forward. "Hernan challenged him hard for 50-50 balls and gave him nothing easy," Cheaves said. "I don't think he was used to having somebody not respect him and get in his face." The Catamounts continued to pour it on in the second half, as Justen Macias scored in the 49th minute, Hernandez scored his second goal in the 56th minute and Perez finished the scoring on a penalty kick in the 60th. The Catamounts are now 64-0-1 since the end of the 2012 season, outscoring opponents 97-11 this season and 28-0 in four postseason seasons. It was the first time the Wolverines had been shut out all season. "We didn't know what to expect coming into tonight, but once we start moving the ball, nobody can stop us when we're doing what we do," Hernandez said. "It feels good to have another chance to win state. It's not just good for the school, but for the whole city. "We're putting Dalton on the map." * Cross Keys 2, Southeast Whitfield 0: The Indians manufactured a pair of goals in the second half to advance to the Class AAAA state final with the win over the Raiders (15-4-3).